The small companies that have been producing all those faith-based films that routinely pop up in theaters have financially done so well, it's surprising more major studios haven't jumped on the Biblical bandwagon. One outfit that has seen the writing on the stone tablets is Sony Pictures, which, through its Affirm Films arm, has released such box office hits as Fireproof and Soul Surfer. Its latest offering is Risen, and what's perhaps most surprising about the film is its restraint. Most other faith-based films of recent vintage tend to preach only to the choir — and by choir, I don't mean Christians in general but those dangerous armies of hypocritical right-wing zealots, the ones who, say, believe that Obama is not only a Muslim but also the head of ISIS, or who think that evangelists like Elevation Church's Steven Furtick are following in the footsteps of Jesus by living like billionaires and preaching in palatial churches that resemble Vegas casinos. Yet Risen is a religious picture measured enough to appeal to filmgoers of all persuasions — in other words, no one had the bright idea of casting Rush Limbaugh as one of the disciples or hiring Ben Stein to serve as the voice of God. It's just too bad it's not a bit better, since its modesty also leads to a noticeable lack of — and pun absolutely not intended — passion. 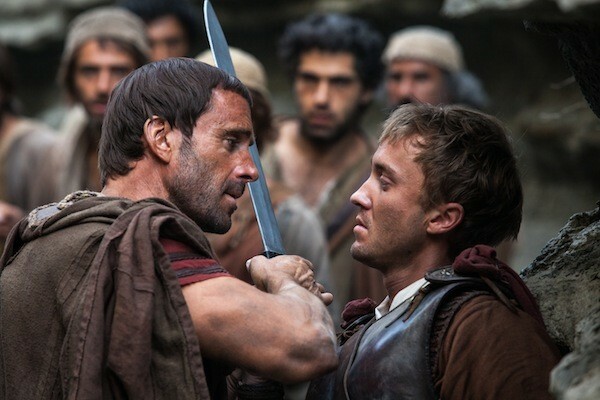 Joseph Fiennes plays the central character of Clavius, a Roman officer who's ordered by Pontius Pilate (Peter Firth) to locate the missing body of Jesus after it disappears from the cave in which it was laid following His crucifixion. As Clavius sets out on his investigation, gathering evidence and interviewing witnesses, he starts to wonder if Christ was indeed more than just a man. In essence, Fiennes is playing George Clooney's role in the film-within-the-film of Hail, Caesar!, minus the ample laughs. Fiennes is fine in the part, and those keeping track of what the Harry Potter gang has been doing will be interested to learn that Tom Felton (Draco Malfoy) appears as Clavius' assistant. But director Kevin Reynolds (Waterworld), who also co-wrote the screenplay with Paul Aiello, often adopts the restrictive impulses of those otherwise sturdy religious flicks of yesteryear, the ones which wouldn't even allow the camera to gaze upon the face of Jesus (or, rather, the extra cast as Him). Risen does give us a Jesus in actor Cliff Curtis, but he remains a beatific cypher, and the takeaway is that, in the same distancing manner as those black-themed pictures told through the eyes of white protagonists, here's a Biblical yarn related not through Christ Himself or even his disciples but rather an individual late to the party. It's not an uncommon approach, but in its focus on the manhunt rather than the man, it basically turns the greatest story ever told into a Very Special Episode of CSI.